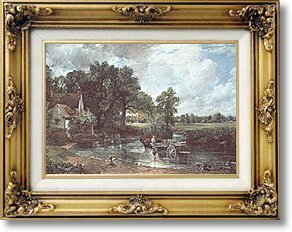 The Haywain by John Constable - no-risk guarantee! Constable entered the art world fairly late in life and made painfully slow progress, giving no indication of the famous masterpieces to come! Born at East Bergholt, Suffolk, in 1776, the son of a prosperous corn merchant, he spent several years in the family business before deciding, and obtaining permission, to study painting full-time.